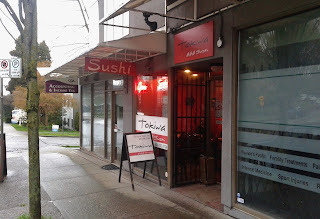 When I located Tokiwa Sushi on Oak St., it was still rather early, and I wasn't hungry yet. Being adventurous, I decided to check out the huge mansions in the vicinity and dream about the things I will never be able to afford. Unfortunately, my petite excursion ended up in disaster when I got lost at a small circular park and could no longer tell which way I was heading. Right at that moment, it also began to pour. Oh great... The smartest thing I could think of was to continue walking in some direction until I hit a major street. Of course, I ended up on the wrongest street possible, which shows that I'm probably the worst companion to have on a camping or hiking trip. Tokiwa Sushi is a small, cozy restaurant that serves mainly sushi rolls and nigiri, along with a few salads. There are virtually no cooked items on the menu. Nothing on the menu was particularly expensive, as most of the special rolls were simple and cost only $4.50. 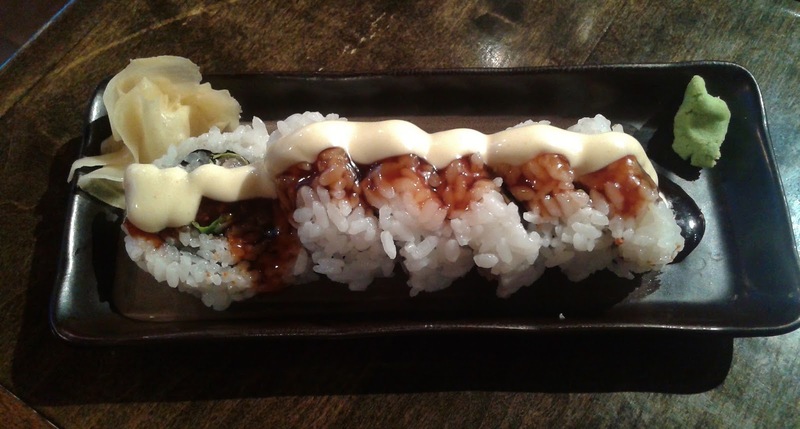 However, the air was filled with the fragrant aroma of Aburi sushi, which left me with no choice but to go for one of their $7.50 Aburi special rolls. I don't know how this is possible, but they actually managed to run out of Tuna Sashimi. 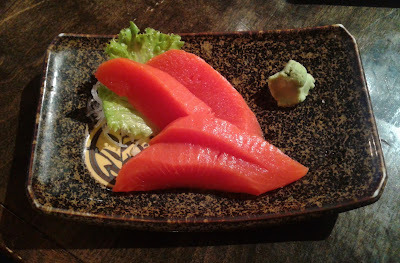 I was stuck with the Sockeye Salmon Sashimi, but at least it was fresh and featured a soft texture as well as a mildly sweet flavour. The Tuna Special Roll was one of their $4.50 special rolls and consisted of tuna, lettuce, teriyaki sauce, and mayonnaise. The lettuce provided some crunch to the roll, and the teriyaki sauce added sweetness to the tuna. I also liked the addition of finely ground bread crumbs, which gave the roll a unique flavour. I wish the mayonnaise was spread out a bit better (it was basically a thick glob in the middle), but overall, the flavours and ingredients went well together. Wow, it looks like I've been blessed with excellent nigiri two adventures in a row! The sushi rice here was packed just a tad too tightly for my liking, but it was again well-seasoned and well-prepared. 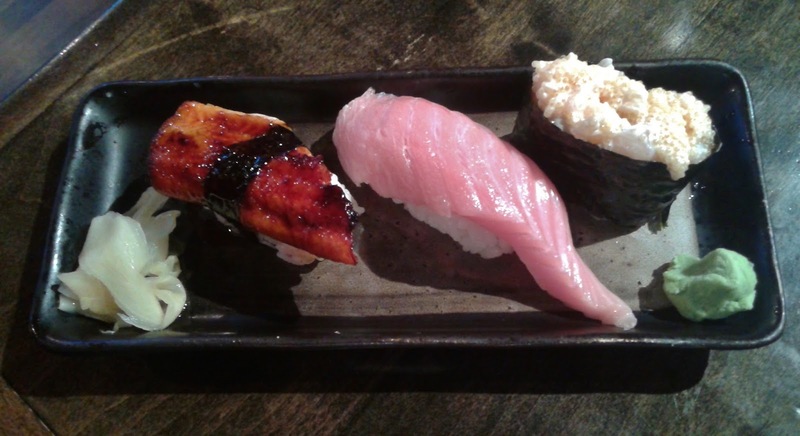 The unagi had a delicious smoky flavour and was warm when it came to my table. The toro was very rich and fatty and melted perfectly in my mouth. I also liked the Chopped Scallop Nigiri, where the mayonnaise provided a harmonized sweet flavour and the seaweed was not too tough. Some tobiko on top gave the nigiri a nice bubbly texture. The Aburi Wild Sockeye Salmon Roll was one of their specials and came with seared salmon, avocado, and miso mayo sauce. Some pieces were slightly overdone, but the pieces that they got right were heavenly and highly aromatic. The miso mayo sauce worked wonders here. I also found the roll rice-heavy and would have preferred more avocado instead, but this issue was sort of alleviated by dipping the roll in soy sauce. The service was quite warm and friendly, and overall, this turned out to be an enjoyable visit other than the fact that I was pretty drenched from earlier. Well, drenched sushi adventures have long since become a regular occurrence due to my sore lack of driving skills. If only they invented a way to drive safely while experiencing a food coma, very blurry vision, and being carsick all at the same time... then maybe I could someday learn to drive.